The Lilac Festival kicks off today. It will take over Highland Park for 10 days of music, food, art, exhibits, parades, races, festivities, and — of course — lilacs. It is estimated that over 50,000 people from all over the world attend every year. (That’s a far cry from the 3,000 that gathered when the festival first started in 1898.) That adds up to a lot of cars and a lot of drivers looking for parking and navigating all the detours and closures. Why not let your mind be festival free (especially if you plan to drink) and get there via something other than your car? 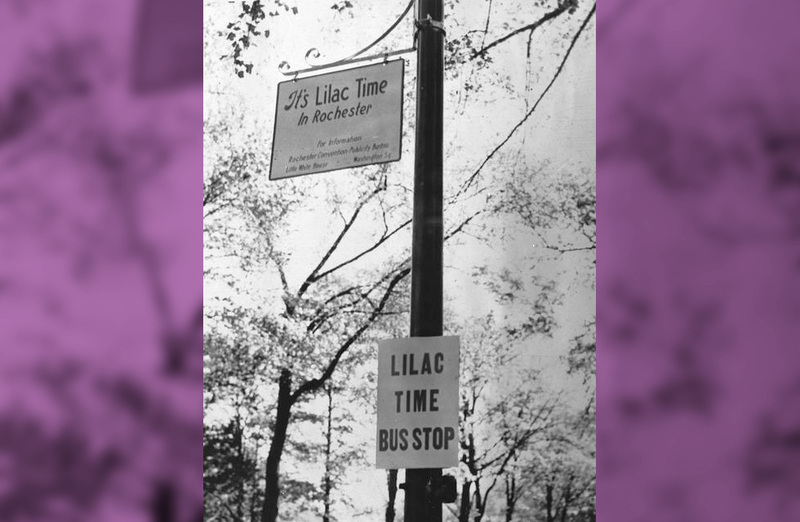 Today, Highland Park and its surrounding streets are still restricted during Lilac Time (see below). So taking the bus can save you a lot of time and trouble. To make it even easier, you can use RTS’s trip planner on your desktop or the RTS bus app on your mobile when you are on the go. Plug in your starting point and “Highland Park” as the destination. Bonus: Your ride each way is only $1. That’s like a quarter of a funnel cake. 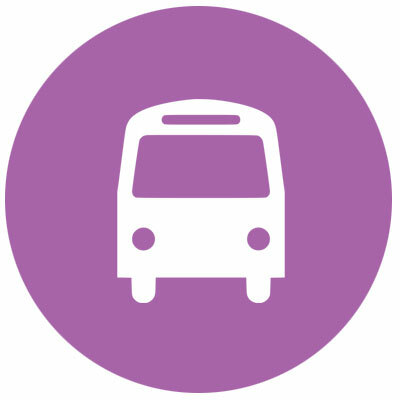 You can keep up with RTS on Facebook and Twitter, so you are current on any changes to the normal routes and schedules. RTS and the festival organizers recommend that you call (585) 288-1700 or visit myRTS.com if you have questions. 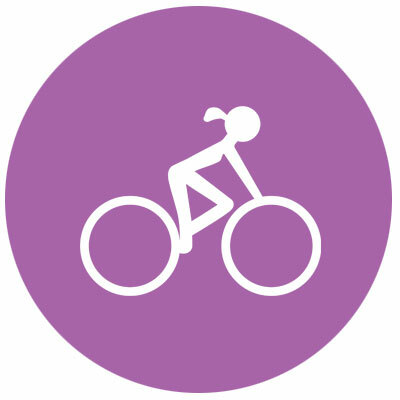 You cannot take your bike into the festival with you. No matter how much you love your bike. 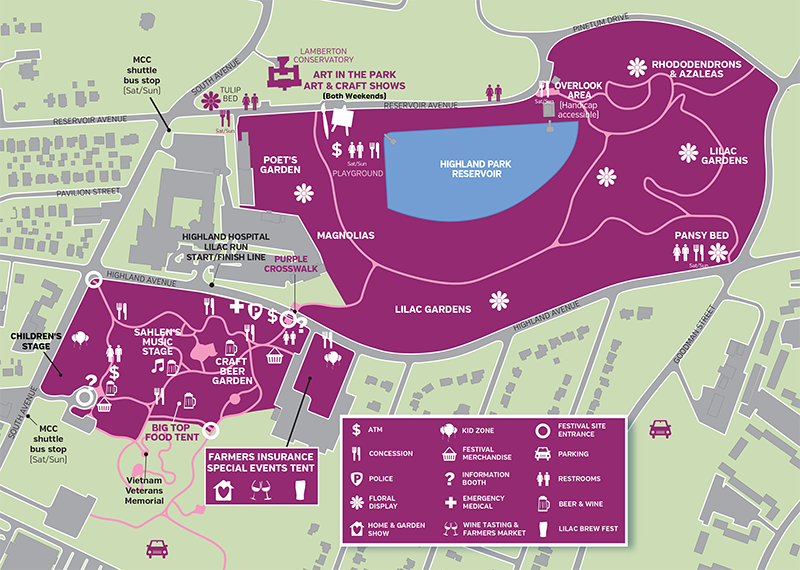 Festival organizers recommend the use of the bike racks at the main festival entrance on South Avenue (the one near the MCC shuttle bus stop on the map). There is security at that entrance, so it’s probably the safest place to park and lock your bike. Don’t forget that you can combine your bike trip with a bus trip too. If you are intimated by the bike rack, don’t be. Here’s a quick video that shows you how to use them. 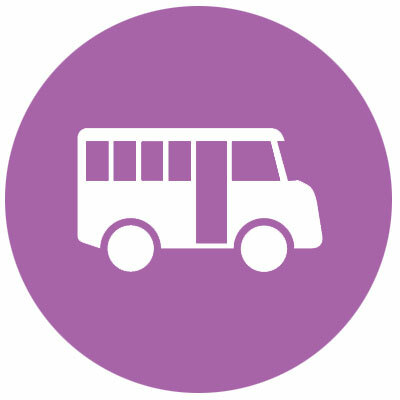 On the weekends, park at Monroe Community College (1000 E Henrietta Rd) and ride the shuttle to the festival. Parking is free. The shuttle costs $2 round trip; children 6 and under ride for free. The shuttle drop off/pick-up is at the corner of Highland Ave and South Ave. It runs 10:30am – 9:00pm on Saturday & Sunday (on May 7th, parade day, the shuttle will start at 8:30am). Handicapped buses are available. Parking is free before 3PM. It’s $5 after that. If you venture out to find what you think is rock star parking beyond those lots, don’t forget to read the signs! The festival organizers remind drivers: “Vehicles parked illegally on the side streets surrounding the Lilac Festival and Highland Park will be ticketed and/or towed.” Emergency vehicles need to be able to get in and out. And keep in mind that there is a hospital there. Remember that Highland Park is a neighborhood. People live around there. When you are out on foot and bike, be polite. Don’t use their yards as a trash can or port-o-potty. Don’t sing so loudly that you wake up their kids and dogs. 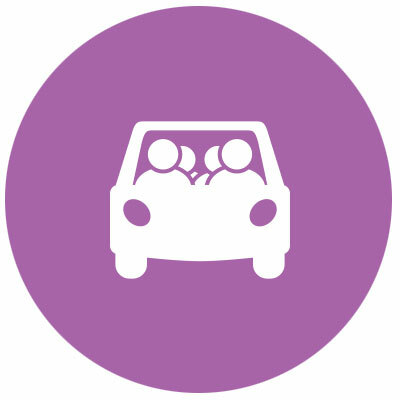 If you are in a car, be mindful of pedestrians and cyclists. Be a courteous and responsible driver. Because people live around there. The festival is open every day from 10:30AM to 8:30PM. Your bikes, skateboards and skates aren’t allowed IN the festival grounds. Neither are your pets, so don’t incorporate a stop at the festival with your evening dog walk. See what else isn’t allowed here.